“I decided taking photos would be a good business. I enjoyed it so much”. Every kid has a dream. All it took was a camera at his matric dance to get 18 year old Andile Gumbi to start dreaming. He had often told friends in the Kwadabeka community that he wanted to be a businessman one day, but was never quite sure of what he wanted to do. Then, on the night of his dance, as he was capturing memories with his friends, something clicked. Eight years later and this determined young man is now running his own video production and photography company called Nyachengo’s, named after his hero, his grandfather. The company was registered in 2011. “The process of registering the company wasn’t hard. I went to SEDA and they gave me instructions on how to register. They gave us one lecture on how to run a business and why it’s important to register your company”. 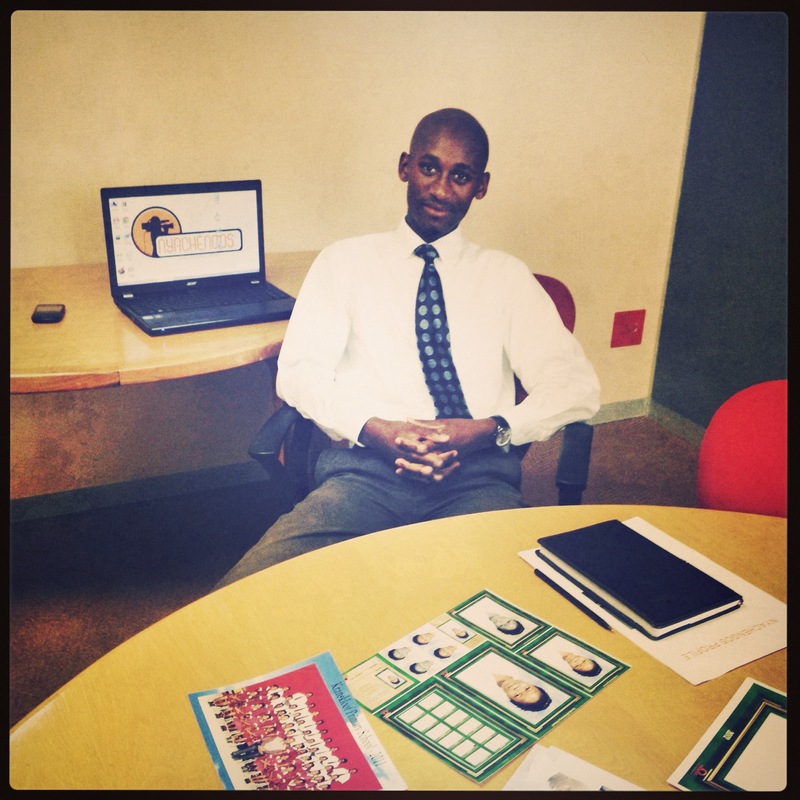 But there was still a lot that Andile needed to learn about being an entrepreneur and running a business. Through his community, he heard about Paradigm Shift, an organisation that is partnered with CAST. CAST has been involved in running Paradigm Shifts Business Growth Course since January 2012. As part of the course, the entrepreneurs are given a mentor – a business professional who meets with the entrepreneur once a month to disciple, encourage and help that person to apply what he or she has learnt. Andile’s mentor was a man, from Westville Baptist Church, by the name of Andrew Jameson. Andile thrived during the business forum. One of the biggest lessons he took away from it is that you have to work hard and fight for your business because the road is not going to be easy. At the business forum he also was encouraged to connect more with God and to read his bible frequently. Nyachengo’s deals with: photography, sound system hire and video filming. They specialise in social events and corporate functions. Their offices are found at Smart Xchange and the business is part of an incubation program there which helps them to develop further. They are able to attend seminars and short courses on business management as well as receive opportunities to network with other people and businesses. This year the company has already signed two contracts with schools, to manage the capturing of their school photos, and Andile is hoping they can sign a third contract by the middle of the year. The biggest challenge they have had is getting contracts for government projects, but Andile still has faith that the business will eventually reach this achievement. It all comes back to having dreams. As an 18 year old, he had a dream, a vision for his life. And he pursued that vision. Along the way he encountered Andrew Jameson, the rest of the business development team from CAST, and a real and active relationship with Jesus. Now he is living out that dream. But the dreaming doesn’t stop there. He has big hopes for Nyachengos in the next five years; hopes which include new equipment, more staff, a company vehicle, contracts with private companies, and ultimately, a big studio in Durban in which he can hold professional photo shoots. He was a kid with a dream. Now he is an adult that’s been empowered to believe in his dream. Every day was a struggle; trying to get R35 to pay for the shelter .It didn’t seem like much and it didn’t seem like it should be that hard to get, but try telling that to Sakkie, a man in his forties who spent his days trawling the streets of Durban looking for work. He would disagree. Having work experience as a boiler and a welder but not being able to get a job anywhere meant that Sakkie had to be out on the streets every day, trying to get the money that would pay for a bed to sleep on…but for someone who is able and wants to work, begging for that money is an all time low. Sakkie didn’t know what he was going to do or how he was going to continue surviving like this. He had completely isolated himself from his family because he felt so ashamed of his situation and couldn’t bear to face them. He was alone in the city of Durban, with nobody to turn to. It was a Tuesday night, and Phil Hamilton was out in Durban Central with a team of volunteers from CAST’s Street Ministry program. Every week, this group walks the streets of Durban at night and visits various shelters, forming relationships with the people they meet along the way and offering them a hand up out of their situation. On this particular night, Sakkie happened to be one of the people that the team came across. He and Phil started up a conversation, and after hearing Sakkie’s story, Phil decided to help him out. Sakkie was put in touch with one of the volunteers, Mike Robbins, who agreed to interview him for a job position in his company. In the past, Mike had been apprehensive about hiring guys off the streets because they would pitch up for their interviews and be smoking “grass” on the side. But Sakkie was set out to prove Mike wrong. Despite a really bad stutter, he impressed Mike in his interview, and after a lot of prayer and consideration, Mike decided to hire him. However, having a job did not mean that things would automatically improve for Sakkie, mainly because at this stage, he did not even have enough money to buy himself a meal. After just a week at work he had to ask for a loan and Mike trusted him enough to give it. Sakkie worked hard for his new boss, determined to turn his life around and prove that he was a capable employee. Mike was really impressed at his work ethic and reliability and was thankful he had taken a chance on hiring Sakkie. It’s a year later and he has managed to pay the loan back and rent himself a flat which he furnished with his own, hard-earned money. A few months ago, he was robbed of everything he had, but instead of getting angry and resentful about it, he just worked hard to replace the stolen goods and now prays for the same men who robbed him. He thanks God for everything and realises that all along God has had a purpose for his life even though he couldn’t see it before. And the most beautiful part of this story is that Sakkie was reunited with his family, who live on The Bluff, and instead of being ashamed of the life he once endured, he is content and grateful for the life he now has. A chance encounter with Phil Hamilton and the willingness of Mike Robbins, may have saved this man’s life, which had been on a heavy downward spiral. There are so many people out on the streets of this country, who are looking, praying and hoping for a guardian angel….for some lifeline. They all have a story to tell and all their stories deserve a happy ending. We, as a community who are able to help, need to step up and get involved because maybe God wants to use us to be that lifeline…to give more stories happy endings. You can volunteer for Street Ministry and many other programmes that CAST runs. There is a place for everyone to be involved.